India’s largest poker site – adda52.com continues to excite poker players in India bringing up amazing new promotions and tournament offerings. Now, the poker site has weaved an enticing new spell this month with its ‘Ace Race’ promotion, which runs from 1st August – 31st August and features not one, not even two, but three leaderboards – each featuring 5 Lac giveaway. The eventual topper in each leaderboard takes 2 Lac. Each leaderboard runs for 10 days. The first leaderboard has started and will continue till 10th August. The second will run from 11th August to 20th August. The 3rd and final leaderboard starts on 21st August and will conclude on 31st August. So, join the ‘Ace Race’ from 1st August to 31st August on adda52.com and stand a chance to hit big. You don’t have to do anything different. 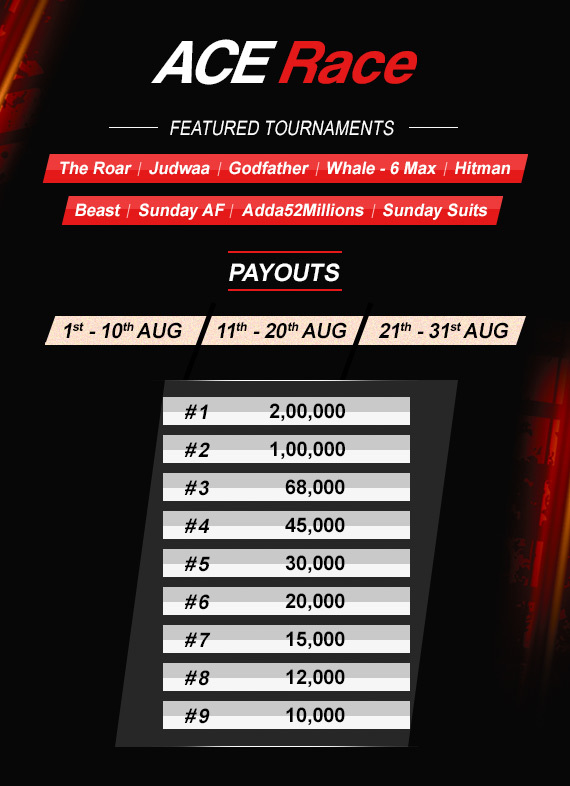 Just play qualifying tournaments – The Roar, Judwaa, Godfather, Whale, Hitman, Adda52 Millions, Sunday Suits, Sunday AF tournaments & Beast. Play as many tournaments as you can and keep scoring your points for 3 leaderboards back-to-back of 5 Lac giveaway each. The higher you finish the more points you get. So, what are you waiting for? For the additional details and information about the ‘Ace Race’ promotion, check out this link.